Valet testimonials - Leather Recolouring and paint sealants. 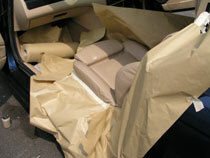 BMW 318ce Sports Cabriolet - seats masked our ready for connollising. "I think that the staff are very helpful and did their best to maintain my confidence in their work. I would recommend Clean Image to anyone looking to improve the everyday wear and tear a car gets. " 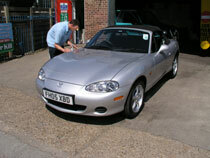 Mazda MX5 undergoing final detailing by one of our valeteers (Sean). "Very professional, at the briefing explained every detail regarding preparation, the way & need, reasons, to cure the problem. On my return I was delighted with the end product and can now show it off to all my friends. "After the main dealer scoured my van in their car wash it looked terrible in the sun. The buffing and Diamondbrite sealant you applied have restored it to it's former glory. 200 miles each way to travel but I think the result was worth it. I would recommend Diamondbrite to anyone. My 14 year old car still gleamed and has never been polished since it was new. Your help and advice withh stone chip treatment and cloth selection were certainly appreciated. An excellent service at a reasonable price. Silver Vauxhall Omega and the back of Mark's head. The car turned out far better than the photos! "Just a quick email to say thankyou for the valet performed on my car today; it looked fantastic and I am very pleased with the results especially the engine which was filthy. My return journey was delayed by a serious accident on the A12; my showrom shined car drew many admiring glances from the 'gridlocked' motorists. Thanks again and I look forward to another visit where I shall get my smart repairs attended too." "Very helpful and welcoming staff. Explained the whole wheel restoration process and I am delighted with the finished results, alloys now look as good as new. I will certainly recommend your services to anyone without hesitation. "The service is excellent with a good attention to detail. 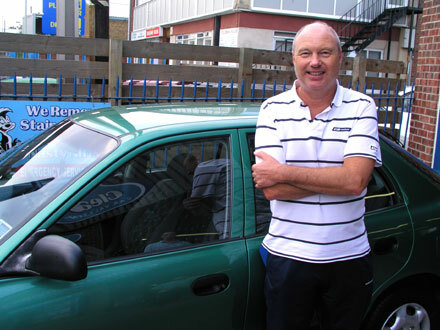 "Mark Chignall was extreamely helpful and proactive in helping to save my paintwork. (Had parked under trees, rain , car covered in thick sap). "Clean Image by definition provide a clean and reliable service. The standard of valetting is very good and a full assessment of the workmanship is provided at the end of the valet. Clean Image's main objective should be consistancey and customer can see energy in this vital area. I see no reason why Clean Image can't continue to build on the work ethic they've established. All the best for the future. " "An excellent job as it was last year. " "Nice job of the car. Called night before to check time coming in and went over car to explain what had been covered. Will definitely use again. "